The opener is the motorized unit that turns your garage door's operation from manual to automatic. This electro-mechanical device comes in a variety of designs. From strong but noisy chain-drive models to silent but relatively more expensive belt-drive units. It can be challenging to choose the best garage door opener for your specific needs. Here are a few things to consider before purchasing a new unit. How Much Horsepower Do You Require? This depends on how large and heavy your overhead door is. If it's wider than 20 feet, you'll need a 1/2 horsepower unit at the very least. Also, keep in mind how fast or slow you want the door to open and close. It's usually better to choose a garage door opener that is slightly overpowered rather than an underpowered one. The screw-drive system is often the fastest one, as it takes almost half the time its counterparts require to open a door. Garage door openers are a great convenience, but they can be potentially dangerous. Most units come with a set of photo-electric eyes mounted on each side of the door's opening. These components stop the door when an object breaks the invisible beam that connects the two sensors. Another useful safety feature is the automatic reverse function, which forces the door to automatically reverse when it encounters any resistance. It's crucial that these safety features are periodically checked, in order to prevent accidents from occurring. Our technicians do this as part of our regular maintenance appointments. If sensor realignment is required, you can count on us to carefully reposition these delicate components and make sure that they are able to properly detect any obstacle. 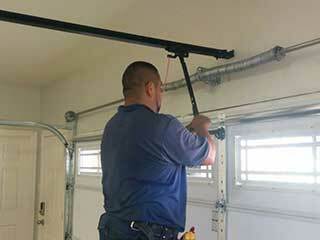 Installing a new garage door opener requires a high level of skill, plus a few professional tools. It is usually a two-person job and can take several hours to get the unit fitted and adjusted correctly. Call our team at Garage Door Repair Delray Beach today to find out how we can help you choose, install, and maintain the right opener for you.